Gluten free bread pudding is such a delicious treat, I have to share the easy bread pudding recipe with you! 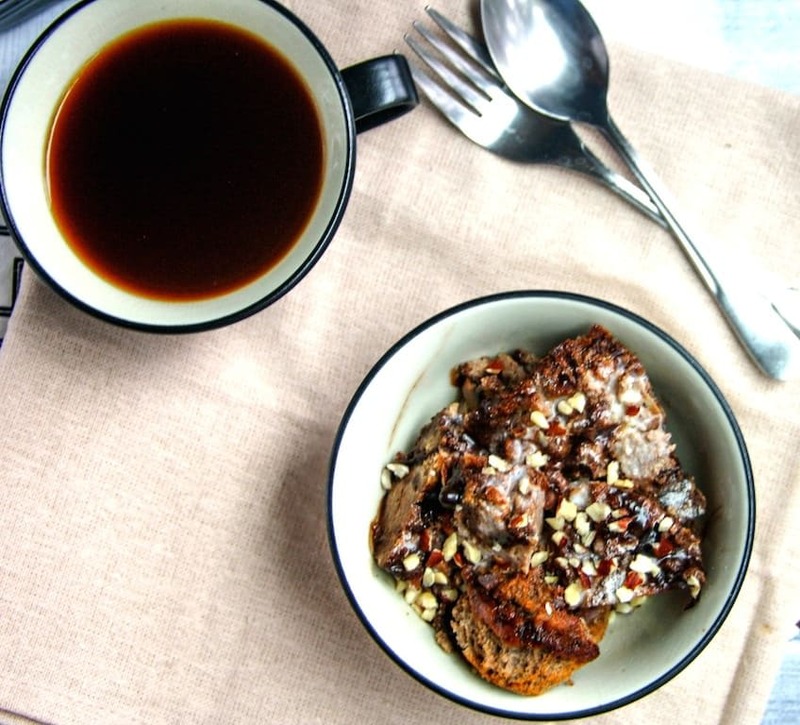 Don’t throw away stale muffins, just make some Mocha Gluten Free Bread Pudding instead. 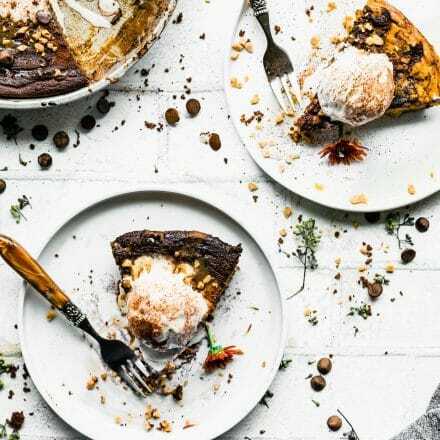 This easy dessert recipe comes with options for paleo and dairy-free eating plans. January is an exciting month, isn’t it? Just feel fresh, new, and light. That is until something happens that is out of our control and we panic. It can be easy to feel like we failed at something when that happens, but in actuality, it’s not failing at all. It’s life molding us into something NEW. So far this year, our car has broken down twice, our garage door broke, and I’ve had two “failed” recipes. But really, all that was not in my control. Okay maybe the recipes we a tad bit in my control, but I’m still in denial. Ha ha! But what if we decided to give up control instead beforehand? What if we focused on turning frustrating situations into an opportunity to reshape? I think that might make your January more adaptable, ENJOYABLE, and therefore lead to a better QUALITY of life. Too corny for you? Okay, let me give you an example. I made Paleo mocha muffins. While in the oven, something MORE IMPORTANT came up and I turned my back on them for too long. They did not burn, but they were a little dry. Still tasty though! What might have otherwise been viewed as a waste of time and energy turned into something of better quality. 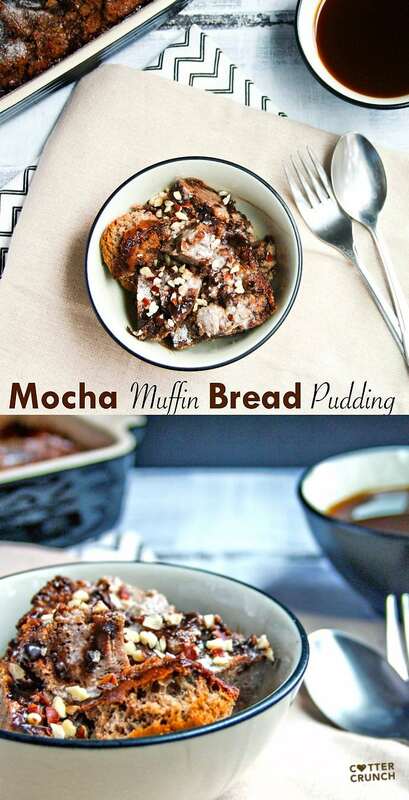 Mocha Gluten Free Bread Pudding. Here’s the easy bread pudding recipe! 2 cups of crumbled or 4 GF muffins, crumbled. Regular or chocolate (stale or dry works!). 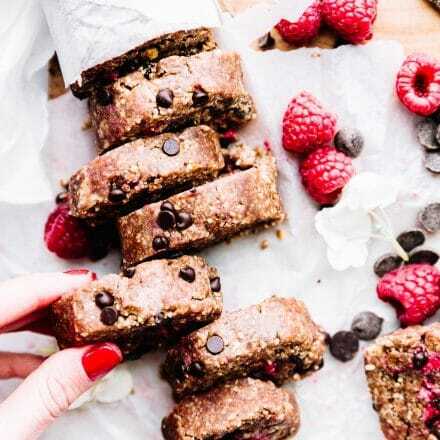 topping –> cocoa powder, chopped nuts, vanilla protein powder, or regular powdered sugar. First crumble your muffins and soak them in the cream. Whip the egg and mix into your creamed muffins. Add in the chocolate, baking powder, salt, and coffee and mix again. Pour into a small oiled bread pan and bake at 350 F for 30 minutes. Top with extra nuts, chocolate syrup, and any other sugar or vanilla protein powder you’d like! 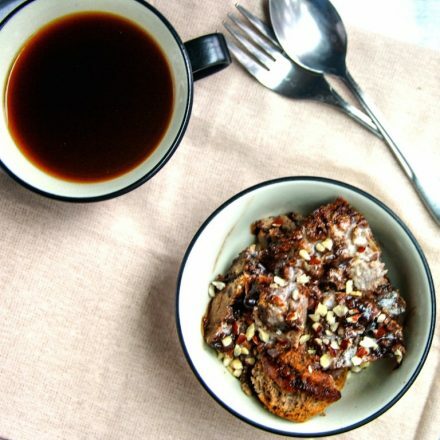 Mocha gluten free bread pudding! A perfect post workout snack (healthy carbs, a little protein, natural sugars). 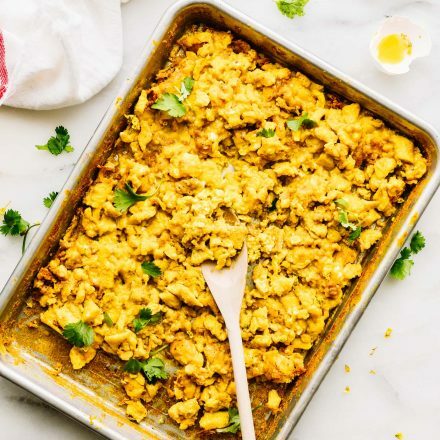 A perfect weekend breakfast or brunch dish, for when you can sip on a few cups of coffee without rushing. 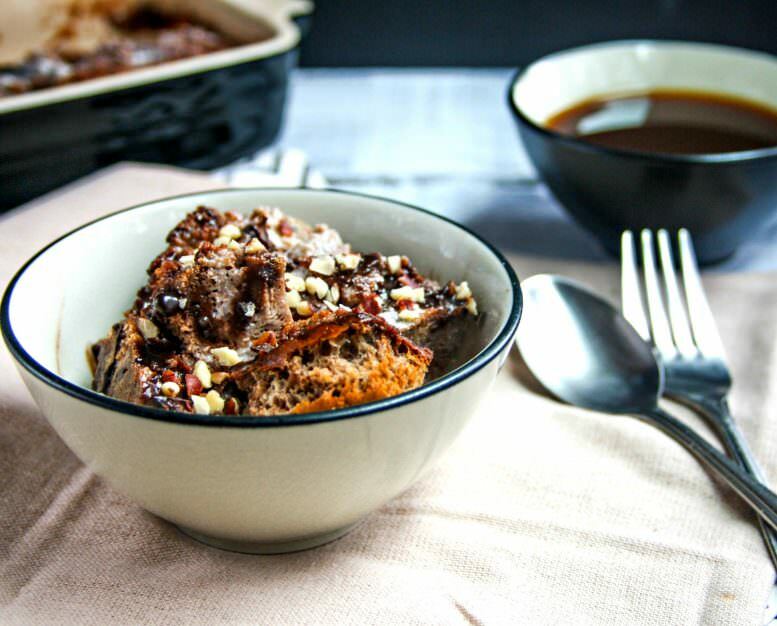 A satisfying dessert that can accommodate to both paleo and dairy free folks! I guess by giving up control, I accomplished more than I had hoped. Yes?! Food for thought, and well, more food! What muffin flavor would you make into a bread pudding next? you snagged my EYE with the light as in Jan it just feels like winter is LEAVING and days are lengthening and the DARK IS GOING!!! I love how you always turn the bad into good. You always have a positive spin on things. That’s what makes you amazing friend! If this is what happens when you make a mistake, I can’t imagine what you will come up with if everything goes perfectly to plan! Uh, cream, chocolate and coffee make everything better! I have never had any type of bread pudding – I wouldn’t even have the first idea what flavor to add. In fact I probably wold have tasted and said they were ruined and pitched them – love the way you made it into something even better!! Hopefully nothing else breaks in the next couple of weeks! Nice! I’ve never made bread pudding! I haven’t had many bread puddings in my day, but this…this looks amazing! I might just have to try this. Probably on a Saturday morning where I can enjoy it over coffee and a book. Bread pudding is my favorite thing in the world. I need to try this one!! Brilliant! When life give you dry muffins make bread pudding! I would make this all on it’s own–I’m a huge fan of bread pudding. I am approaching the age where I feel like a dry muffin, so this advise is well needed-ha! Have a lovely day friend. Did someone say mocha or coffee? I am all over this!! Already pinned and I can’t wait to make it! I love your positive attitude. Thanks for another great recipe! Great food for thought my friend, and a delicious one to boot! Oh yes, January was exciting for sure. Seems everyone was asking us for money, definitely ready for Feb! lol. Way to have a positive attitude lady! And bread pudding, hell yea. This looks so delicious! I feel your pain with failed recipes. I call it “recipe heartbreak” because the stages you go through with it are similar to a failed relationship 🙂 Just picture the food saying “it’s not you, it’s me” 🙂 And car breakdowns are seriously one of my biggest fears. Anything out of my control that I don’t understand and can’t fix drives me crazy! Sorry to hear about your car! On the upside, you have this delicious bread pudding to cope! Looks delicious lady! But you’re right- many things are out of my control, but I can choose to make the best of them. If I haven’t said this before – lady – you rock!!! I love how you took (what you construed as) a fail and made it into something EPIC! I love muffins, I love chocolate, I love cream and I love nuts. Oh and I love bread puddings. Never made bread pudding out of muffins! Love! I’m a big believer in the fact that happiness depends 90% on attitude and only 10% on circumstance. Or around there, anyways 😉 And I’m also a big believer that I’ll take multiple servings of this bread pudding. Please and thank you. This looks seriously amazing…..I may just overbake some muffins so I can make a batch!!! Yum, I love bread pudding! This is such a creative idea for muffins that didn’t quite work out 🙂 thanks! Hmmm I kind of have cornbread going stale… I would how chocolate mocha cornbread would workout haha. thanks Hayley! hope you are doing well. keep me posted! Morning Glory…I love love love those hearty delicious muffins…Now that I think about it, it has been way too long since I have had one of those bad boys! it’s like the chili, once you start making it, you get hooked! Bread pudding is one of my favorite foods on the planet. This one looks spectacular. Bread pudding! My favorite. I haven’t had it in forever. Now I know what to do with the stale muffins in my house! Love you and how you are able to flip your perspective. I love your outlook on life! It is so inspiring and being able to turn any situation into something positive is such a great quality! Love this little life lesson you shared with us along with the delicious recipe!! Yummy! I love when recipes happen like this! Happens to me a lot! My mother in law makes a famous cake that the family calls, “Mistake cake” because it was made by mistake! haha i love it! well this must be my mistake bread pudding. Perfect! YESSSS. Love this because we share the same wavelength. Maybe we need to coin the term #frugalfoodies haha! You always put a positive spin on everything- not just kitchen related. Love it! totally! frugal yet still the attempt to be healthy. Ha! do we get an award for this or what? LOL! Oh.My. This looks decadent. Yummmmm! three words — I’m on it! I need you to come cook for me! I hope this arrives at my doorstep in the morning… Yum! Def. Coffee bread pudding! Very smart move—your creation looks fantastic! I’ve never had bread pudding before! This makes me want some now! 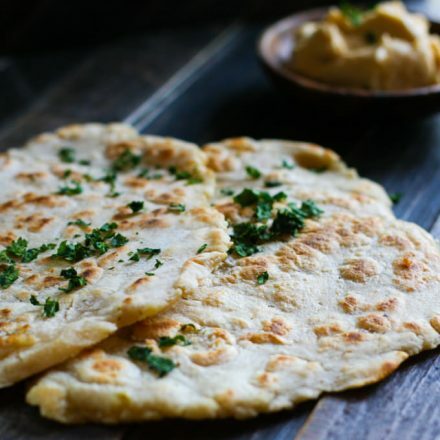 for when your paleo bread or muffins are too dry, this is a lifesaver! mmmm. this looks so good. i love coffee. i love bread pudding. i love you. dude, i love you more. and foxy man! I like the idea of turning failures into successes. I also think you have to fail in order to succeed or even more so, you have to be able to overcome failure in order to succeed. This is the same concept, and I can get down with it.